All right is always two words. Alright is not a word, although like altogether and already it looks like is should be. Clearly, we who use the English language are moving toward acceptance of alright as a word, and computer spellchecks are allowing such a formation. 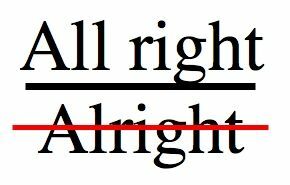 To the more regressive grammarian, the word alright does not yet exist and hopefully never will.